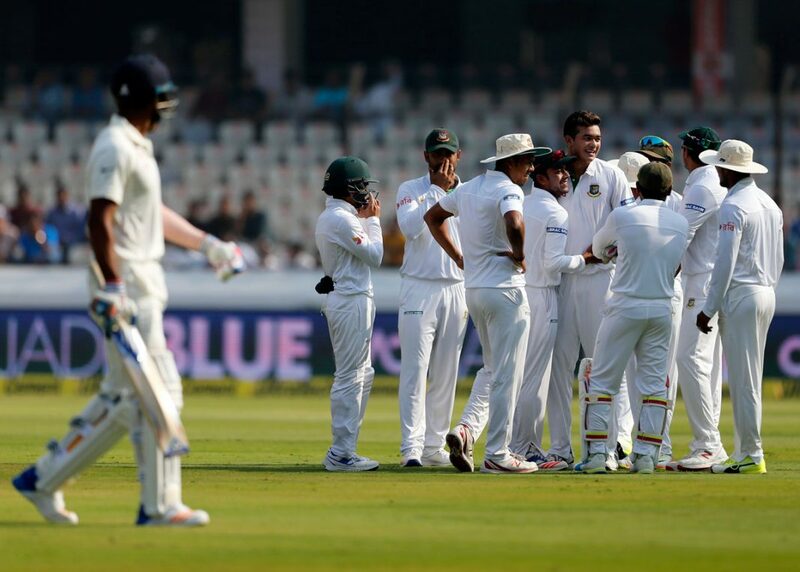 Bangladesh, at last, completed the circle of playing test match in all test playing countries as they have come out on the field to face India in one-off test at Hyderabad. Virat Kohli won the toss and decided to bat first on an apparent grassy but hard and solid track to bat on. Bangladesh started phenomenally as Taskin secured a wicket on his fourth delivery. He offered an over-pitched delivery outside off-stump but Rahul only could able to drag the ball to the stumps. Bowlers were fiercely charged up in the morning but luck deprived them miserably. Couple of catches wasn’t carried to the fielders. Pujara was edged by Miraz’s two deliveries in a single over while pushing away from the body but they were too far from Shakib. Bangladesh couldn’t blame their luck for muddling up an easy run out chance. Pujara and Vijay messed up completely while taking a single and Rabbi did well in square-leg cordon to pick up and throw the ball. Miraz failed to grasp it and in the meantime Vijay returned to the crease. India started slowly but gradually accrued the momentum. They scored 86 runs in 27 overs in the first session.